We take on digital landscapes, armed with decades of marketing experience and the latest developments in technology. Our four-pronged approach ensures we come at marketing puzzles from every angle. 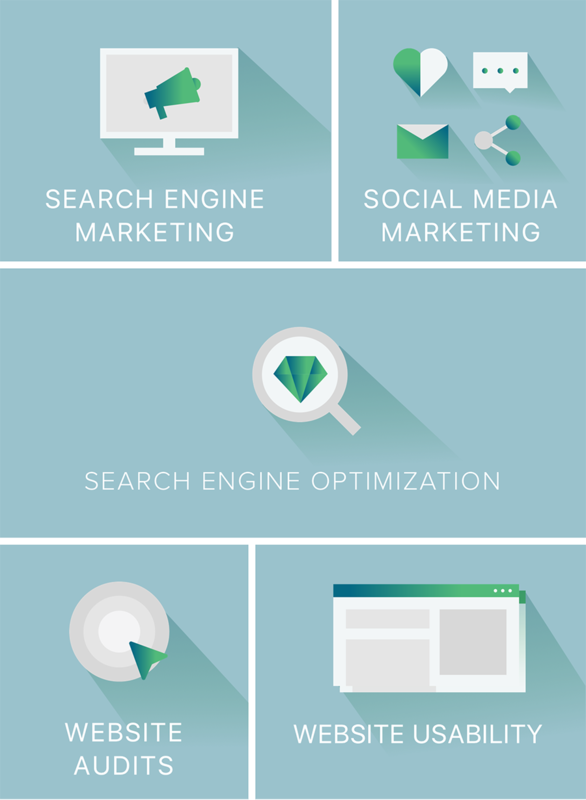 We're search engine marketing specialists who turn websites into companies’ best salespeople. We prep and prime them to be visible, welcoming and relatable. Your website has a lot of jobs: increasing ecommerce, generating leads, and providing the right information to drive in-store sales. But it can’t do any of that if your website is unfindable. We make sure users will stumble upon it, even when they’re not looking specifically for your brand or business. They should be able to look up the products or services your company sells and bing! You come up. Once you do and they pay you a visit, we make it easy to find what they need on your site so they can go on their way, satisfied. We create and implement focused SEM strategies, making sure your potential customers receive the most useful website experience they could ask for. This is what separates highly profitable websites from those that merely function without offering value, or dazzle without generating revenue.